It’s pretty clear that Donald Trump views virtually everything from the prism of winning and losing. And every issue is looked at with a very short term horizon. There does not appear to be any satisfaction derived by developing a long-term strategy, methodically implementing it, and seeing the seeds planted blossom into a beautiful garden that is sustainable and beneficial to all. The idea of win-win is not how he sees the world. It is very zero sum and he wants results now. A good example of this is his obsession with producing more goods in the United States and importing less. Exports and domestic manufacturing mean we are winning and imports equate to us losing. If only the world were so simple. This is another example of needing to be careful about what you wish for. The following chart shows our current account balance as a percentage of GDP. A positive percentage means we are running a trade surplus (exporting more than we are importing) and a negative percentage reflects a trade deficit (importing more than we are exporting). A few takeaways. Since the late 1970s, it’s been pretty rare for the United States to run a trade surplus. The only time’s surpluses were generated were during recessions and periods of slowing economic growth. In fact, virtually every recession was preceded by an improving trade balance or it occurred during a recession. If history is any guide, then he should not be fighting aggressively for a trade surplus. As part of this desire to reverse our trade deficit, Trump is fighting for manufacturing jobs and he has his sights clearly set on China to win the manufacturing war. 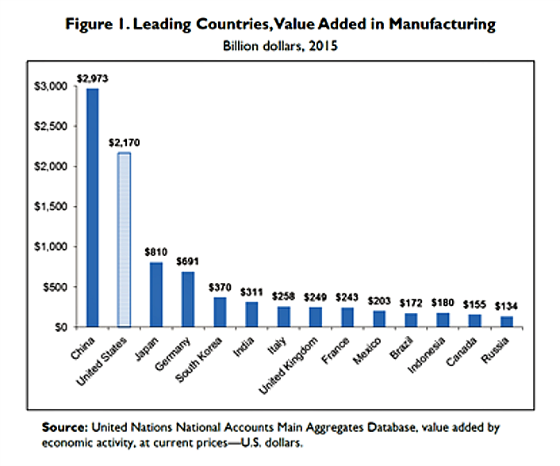 The following charts show that it’s a two-horse race globally in terms of manufacturing strength: China and the United States. If you believe that not being in first means you are losing then you will do whatever it takes to win, even if your actions may be counterproductive. Usually, the goal is to grow the pie so that all boats are lifted versus acting as if it’s a zero sum game and taking action that may have you come out on top, even though you may be worse off for it due to a shrinking pie. 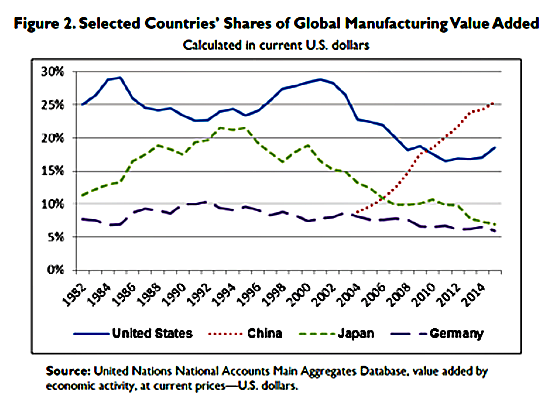 The first chart shows that China is producing more of the world’s manufacturing output and the second chart shows that it has gained market share at the expense of the United States and Japan. Finally, the third chart shows that our ship has sailed and we are no longer a manufacturing-oriented economy. We are services all of the ways and this reflects our growing national wealth and productivity. Trump harkens back to the day when America was the pre-eminent power after World War II and we could rebuild Western Europe and Japan and provide them with massive quantities of goods and services. Of course, this required a big investment through the Marshall Plan and opening up our markets to cheaper, Japanese manufactured goods. After all, a current account surplus requires a capital account deficit (money leaving the country). The converse is obviously true as well: A current account deficit requires a capital account surplus. At the end of the day, one does not always know whether the current account deficit is driven by strong relative economic growth, a high demand among foreigners to invest in the United States, or a combination of both. Trump’s obsession with bringing manufacturing jobs back to the United States is going so against the grain of economic and productivity trends established decades ago. 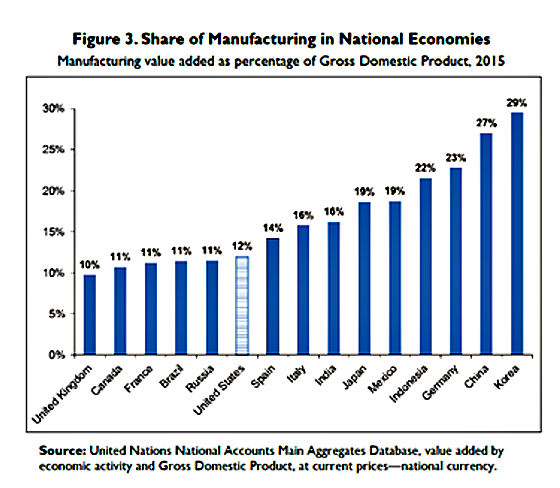 The following graph shows manufacturing employment of major economies (with the exception of China) from a comprehensive report on manufacturing. One can see that both the short-term and long-term trend is for employment in manufacturing to be shrinking around the world. The only exception is China which must drive Trump crazy. 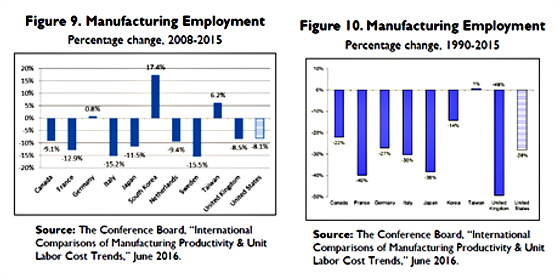 The following table is from The Peterson Institute and shows how manufacturing in China has grown between 2000 and 2014. 2000 32.40 n.a. n.a. n.a. 2001 30.10 n.a. n.a. n.a. 2002 29.07 n.a. n.a. n.a. The question is why has China bucked the trend and has this come at the expense of the United States? According to the author, there are several important factors unique to China that have led to this outcome. China is growing at a pace several times that of the United States and it is at a much lower level of per capita income than the United States and the other industrialized countries examined by Robert Lawrence. As a result, Chinese household consumption patterns, while beginning to change, are much more concentrated on goods rather than services, leading to a strong growth of manufacturing output. China’s growth over the past decade and a half have been driven largely by a high and rising share of investment in GDP, further compounding the demand for inputs produced in the manufacturing sector. Finally, the liberalization of the economy associated with China’s entry into the World Trade Organization (WTO) in 2001 led to a huge surge in China’s share of global exports and particularly its share of global manufacturing (link is external)exports, which tripled from 6 percent in 2000 to 18 percent in 2012. In contrast, over the same period, the US share fell by half, from 18 to 9 percent. China is at a much different stage in its economic development than the United States. We need to keep focusing on where we have a comparative advantage and not focus on manufacturing those items for which we do not. In an economy that creates and eliminates approximately 5 million jobs per month, a targeted industrial policy towards an industry that is becoming more and more automated and less labor intensive is completely counterproductive. All it will do is open up the possibility of a trade war, harm the United States economy, and make it more risky to invest in the United States for fear of the President’s reaction to something he does not like. I sure hope cooler heads and rational economic thinking prevails but I’m not optimistic. Will we be able to reverse our trade deficit? What is our responsibility to the global community?